Full disclaimer: Venom isn’t connected to the Avengers. So if you’re here to see how the movie connects to the Avengers, then you should probably move on. However, if you’re here to actually read about Venom, then please continue reading. Tom Hardy gives his all in every movie he signs onto, and Venom was no exception. 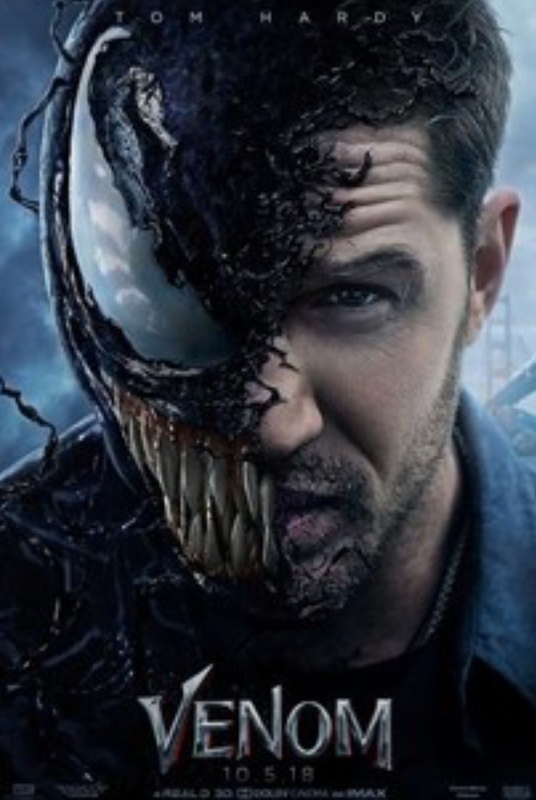 Hardy plays Eddie Brock, an investigative reporter whose life falls apart just from asking too many questions to the wrong billionaire scientist, Carlton Drake (Riz Ahmed). Drake is trying to use the space specimens — the venoms — that quite literally fell from the sky to try to help mankind. We’re overpopulated, we need to fix it — essentially Thanos, as an extremely rich human being. Brock gets infected by one of the specimens, Venom, by accident and basically spends the entire movie trying to fight the voice inside of his head, which is Venom. The Venoms’ original goal was to take over earth and eat all of the humans. However, the Venom inside of Brock’s head has a change of heart as he experiences human life through Brock’s eyes. Venom is another Marvel comic-turned-movie that the Marvel Cinematic Universe (MCU) has produced, so it obviously has great visuals. Whenever he was about to eat someone, Venom’s extending tongue was a bit excessive. Besides that, I was truly impressed with how they brought Venom to life. The way they showcase Venom speaking to Brock in his head is not only interesting to see, but also hilarious, as they have many snarky conversations throughout the course of the movie. What impressed me the most about the movie were the fight scenes. You can tell the visual directors, the graphic artists, and everyone in-between really put effort into making the scenes seem realistic, or as realistic as an oversized parasite fighting can get. The way they incorporated Venom’s ability to control Brock’s body in a fight to keep him from getting hurt was very cool to see. However, these scenes haven’t been impressive to everyone. Venom hasn’t gotten the greatest reviews from critics. Some claim that the movie is “too much” and that the writers failed at connecting the emotions felt in the film to the visuals seen on the screen. I’ve seen some critics that say the movie is just messy, and while I may have liked the movie, this is true — the movie was a bit messy. But I also believe that people were expecting Venom to be like an Avengers movie, or even an X-Men movie, but it wasn’t. And I believe critics were disappointed with that. Overall, I’d give the movie 4 out of 5 stars, 8.5/10 rating. Like always with a Marvel movies, be prepared to be amazed by the visuals, but also bring your best smile for the good laughs throughout the movie. This movie is rated PG-13 for intense violence and action, and language.